As a homeowner, it can feel almost impossible to learn everything you’re supposed to know about every renovation project you’re interested in taking on. It’s important to remember that you don’t have to become an expert on every task you intend to have done around your house, but it is a good idea to do enough research that you can have an educated conversation with your contractor about the job is going to be done. In this particular guide, you will learn key terms and information about shopping for exterior paint for your home. Painting a house is a big deal that often comes with a fairly significant financial investment, so it’s crucial for you to understand exactly what you are buying when you purchase your materials. Remember, though, if you ever have questions during the process, you should feel free to ask your contractor. He or she is there to make sure you feel good about the job every step of the way. What is the average price of exterior paint? The cost of exterior paint ranges dramatically, with store brands typically costing $15 to $20 a gallon and upscale, designer brands sometimes priced over $100 a gallon. The more high-quality paint is, the longer it is designed to last, but most homeowners in North Carolina and South Carolina ultimately choose mid-grade exterior paints that suit their budgets and still look great for several years. When is the best time of year to paint? This answer to this depends somewhat on the location where you live. Ideally, the outside temperature should be no lower than 50 degrees and no higher than 90 degrees, with low humidity, for exterior paint to dry properly. In the Carolinas, spring and fall are often the best seasons to do outdoor painting, but summer can also be a good time, especially in mountainous regions with higher altitudes. How long will a good outdoor paint job last? Although some homeowners choose to paint the exteriors of their homes every year or two, today’s outdoor paint is often rated to last about a decade, especially if it is put on by professionals and multiple coats are used. 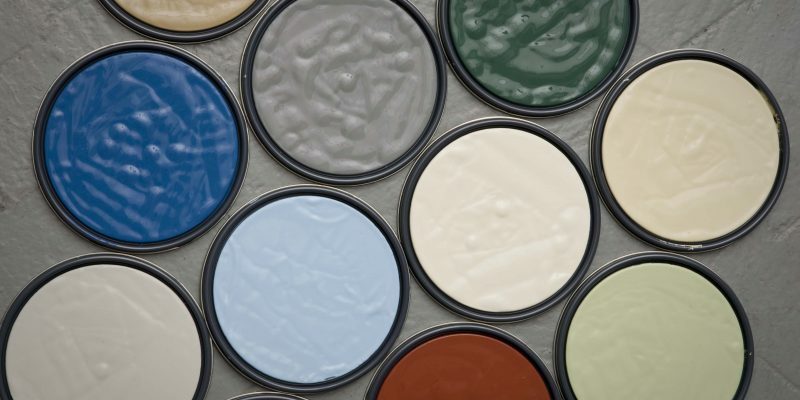 Because your paint is likely to be around for a while, it’s important to consider the color you select carefully! There are several key terms you ought to be aware of before you start shopping for exterior paint. Knowing what these mean will make it easier for you to pick paint that is appropriate for your needs. Pigment-Pigment refers to not only the hue of a particular paint but also its opacity. It is created by adding both powdered, organic minerals and synthetic colors to paint bases. Dry-film thickness – Every exterior paint has a different dry-film thickness, which is its thickness once it dries on a surface. The thickness of paint is measured in a unit called mils. A single mil is approximately 1/1000 of an inch. Typically, better quality paints have higher dry-film thicknesses. VOCs – VOCs, an abbreviation for volatile organic compounds, are materials that can be found in paints, ultimately leading to both health problems and adverse environmental issues. If you’re concerned about being as green as possible during your renovation, make sure you choose low-VOC paint. While it might seem like painting the outside of your house is a task you can easily handle on your own, you might ultimately find that it is more tedious and time-consuming than you were anticipating. The team at Hatch Homes would love to handle this project for you, freeing you up to enjoy what really matters. Our crew is passionate about doing jobs correctly the first time, so you’ll never have to worry when you choose our services.